1. My number one reason for staying at Disney’s Grand Californian Hotel & Spa is the direct access to both parks. From the hotel you can walk directly into the Downtown Disney District, which gives you access to food and shopping on your way to the park. More specifically you walk directly past a Starbucks on your way into the main entrance of Disneyland…this is a bonus for the coffee addict in me. From the other side of the resort you have access to Disney California Adventure Park, which comes out right next to Grizzly River Run and Soarin’ Around the World. Having access to the hotel from both parks is great, especially if you want to take a break during the day or even just run back to the room because you forgot something, which happened to me more than it should have. 2. Competing for the number one spot of the available Disney character breakfasts is the Storyteller Cafe, located at the Grand Californian Hotel & Spa. In my opinion, based on the Characters you see, the menu options and engagement with your children, this breakfast is the best. And psst…Parents if you want a mimosa or bloody marry, they have you covered. The hotel also has a separate restaurant and bar located right off of the main seating area of the Hearthstone Lounge, Napa Rose. I have not eaten at the restaurant, which is shocking since I’ve probably stayed at this property more times than I can count… but I have popped in for a glass of wine to go… because it’s Disney and you can do that. 3. Another major perk of the hotel is that they recently renovated all rooms. When we arrived in early October 2018 the exterior was still under construction, but the rooms, common areas and amenities were complete. After we arrived, we never saw the main entrance to the hotel again except for when we called our Uber to take us to the airport on our last day. 4. The Hotel has beautiful courtyards, perfect for an outdoor cocktail reception. A large conference and event center are attached off the main lobby. I’ve only walked past them on my way to the park, but they look impressive and I’m secretly hoping that one day my employer will offer a conference there. 6. From the lobby main entrance and past the guest check-in you will walk into a draw dropping open air – three story, log cabin lounge inclusive of a cozy nook with rocking chairs lined up in front of a wood burning fireplace. This space is dedicated to continuing your relaxing stay at the Grand Californian Hotel. 7. Another area that I did not spend nearly enough time enjoying was the three pools inclusive of a water slide, life vests for the littles and life guards at each pool. Large lounge chairs with shade umbrellas made for a great place to take shade from the sun and relax a little between parks. Salt & Straw (NEW) This is an exciting new ice cream spot that is a must on your trip. The Splitsville Luxury Lanes bowling alley is a new attraction for me in the Downtown Disney District. Marceline’s Confectionery is always one of my favorite stops because they have a glass window where you can watch the candy apples being made. Plus the chocolate is out of this world delicious. Disney at Home was a nice surprise and a great place to find those last-minute gifts for family members at home. From coffee and tea to dog toys this store really had it all. If you needed Mickey Mouse fine dining ware they had you covered. The store reminded me of a home goods store but except everything is Disney. The Disney fashion trends have definitely changed since the last time I visited Disneyland. 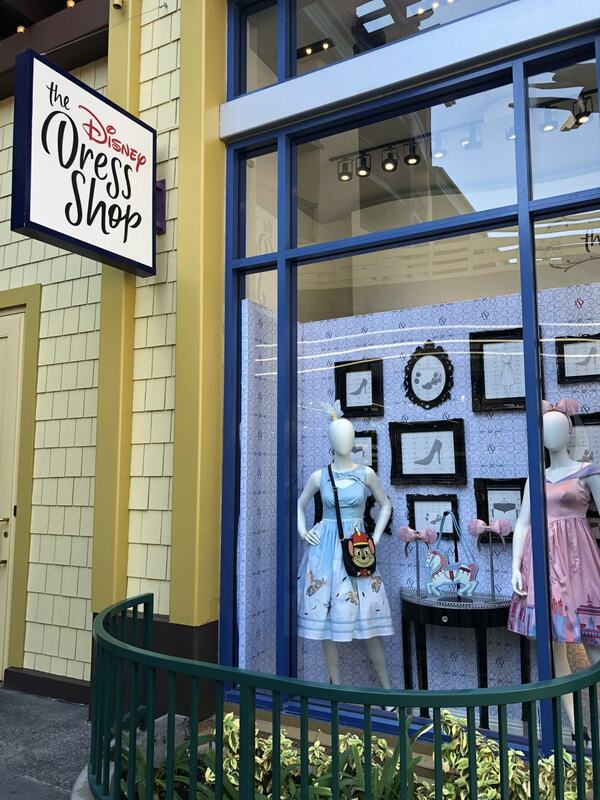 I wandered into a a beautiful Disney Dress Shop, it’s what I would consider an upscale Disney dress boutique and was blown away by the beautiful dresses that Disney was offering teen and ladies. The prices points averaged around $100 and up for dresses. This is so beautiful! Disney does EVERYTHING right. Great ideas, Jennifer ? ?